Fabricated a compound bracket that is now just one piece of steel. 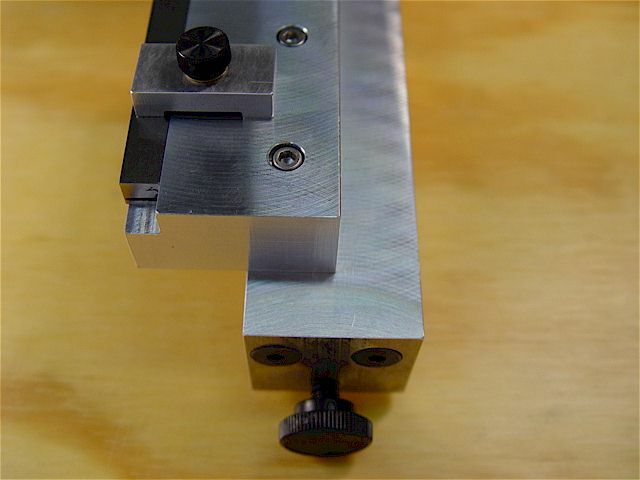 Low tool post to cross slide deflection while cutting-off a 1" mild steel rod. 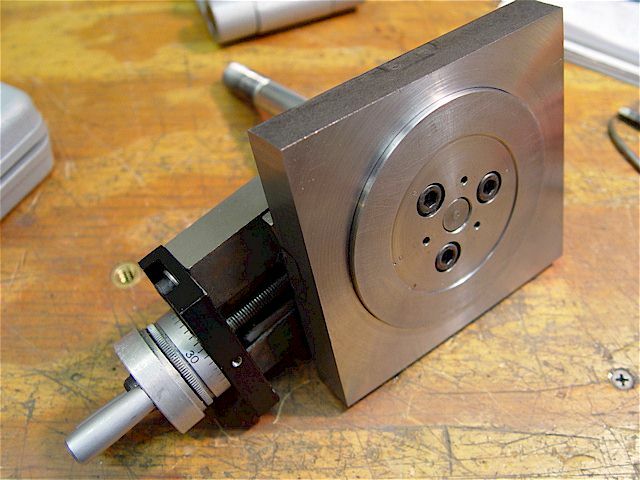 The added support increased tool post rigidity while lowering chatter. 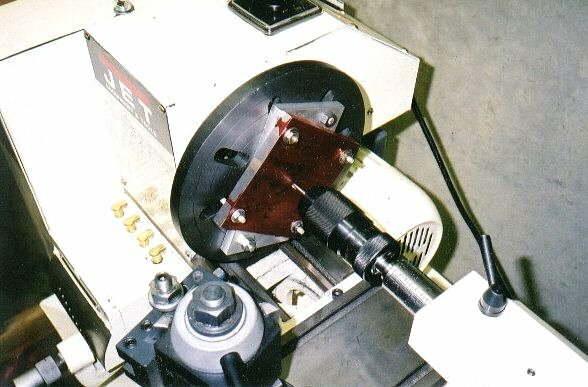 A jig holds precision ground angle plates against the lathe's compound for accurate taper-cutting setups. 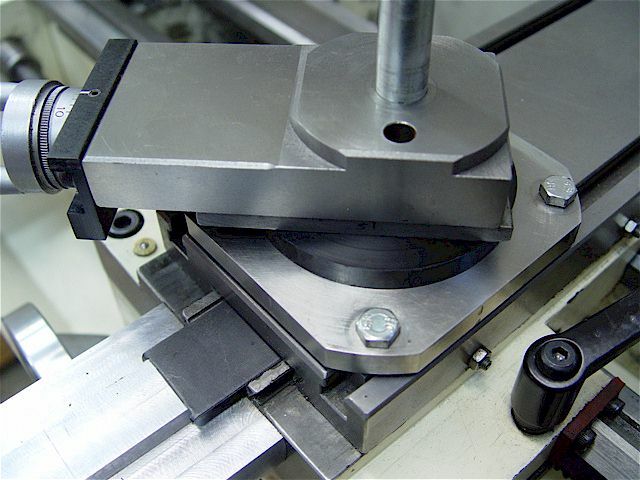 A base clamps to the cross-slide table to hold & position the upper bracket. 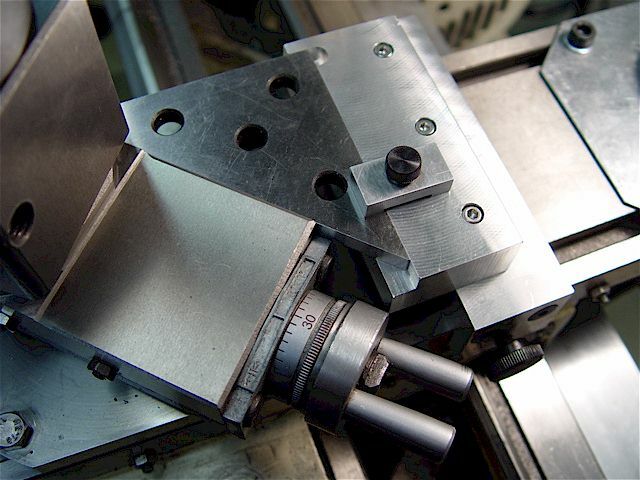 The centrally relieved area allows the compound's mounting plate to clear the base. 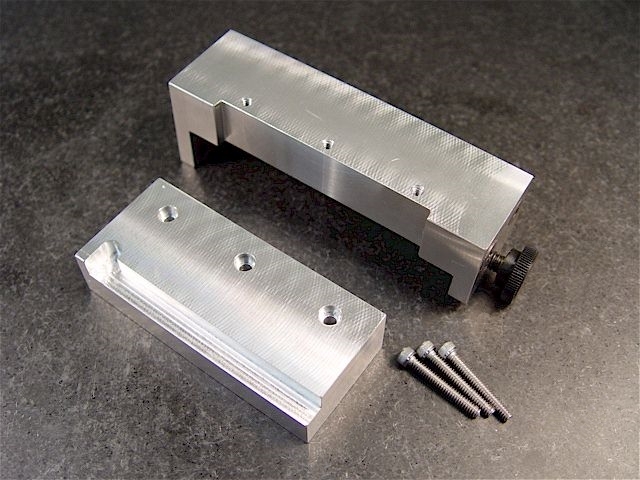 The upper bracket holds any of the different precision angle setup plates against the compound's front edge. Three, counter-bored clearance holes were made for the 6-32 SS attachment bolts. 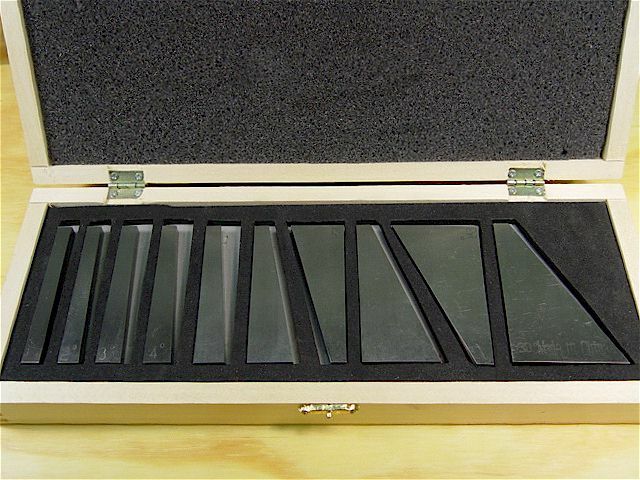 Hardened, 1/4" thick, precision-ground angle setup plates; 1, 2, 3, 4, 5, 10, 15, 20, 25, & 30 degrees. 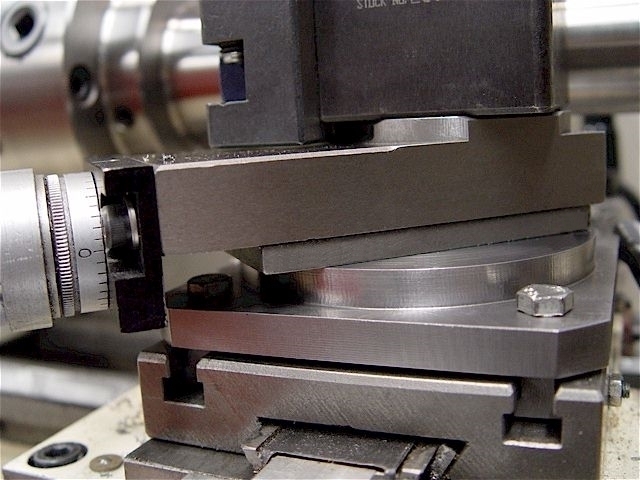 Use a dial test indicator mounted in the spindle to make the final alignment. 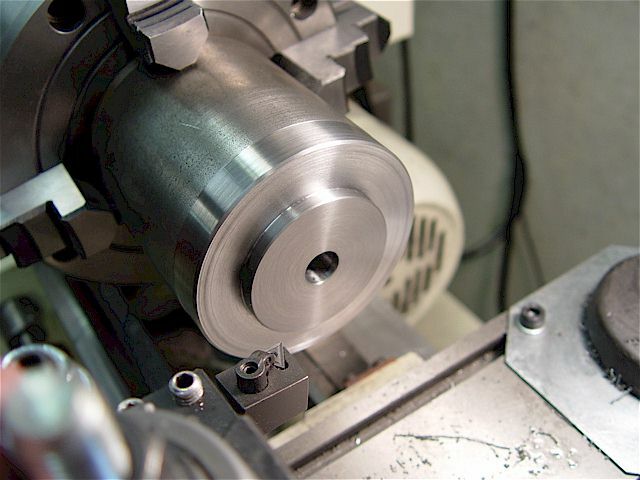 The lathe spindle is engaged at its lowest speed to hold it steady. 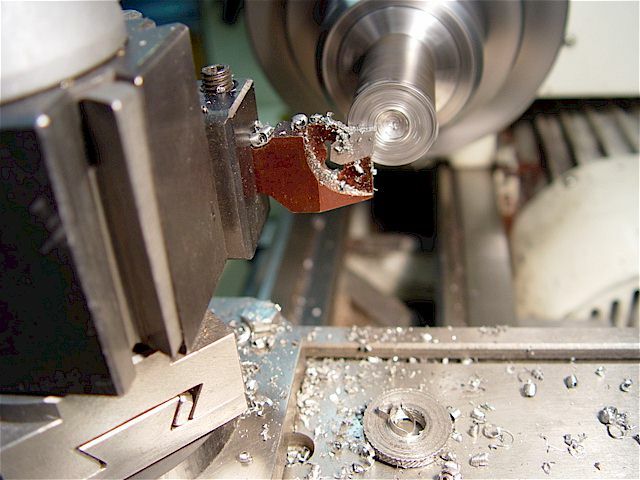 CAUTION: DO NOT TURN ON THE LATHE. 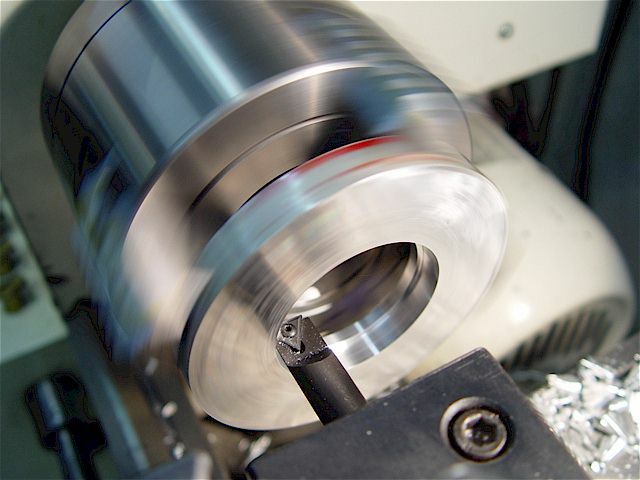 It is good practice to activate the E-stop button while setting up the lathe. bolts & recheck alignment. 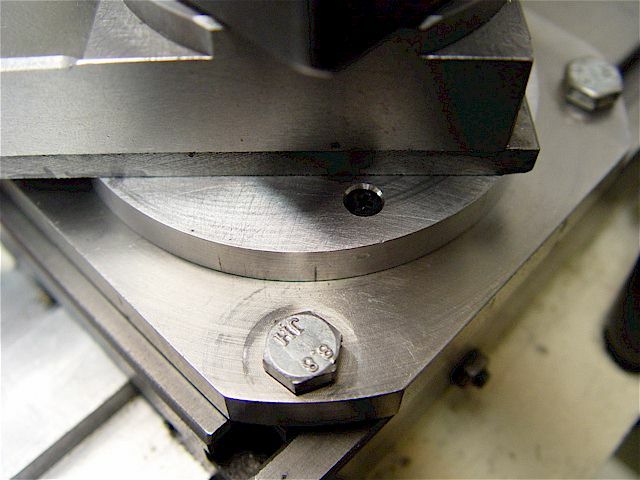 The 6-32 bolt holes were sized for a free fit (#25) to allow for this adjustment. Detail of corner relief & toe clamp. 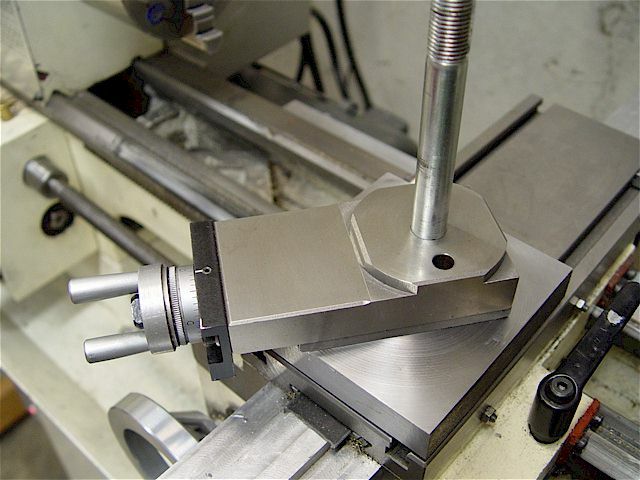 A 1 deg angle is held by the jig & toe clamp. 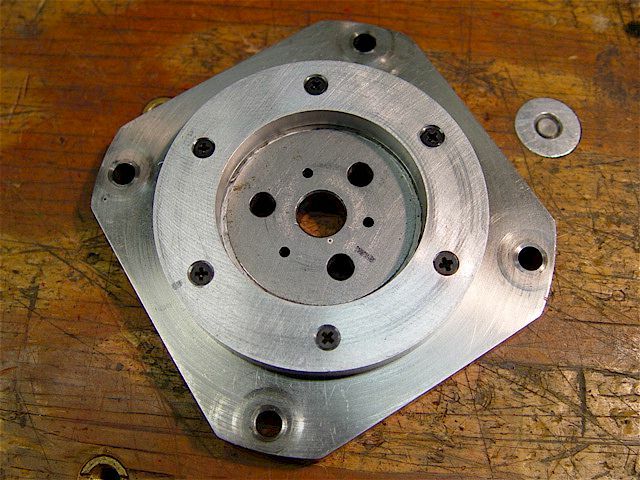 The jig was designed to hold this smallest angle plate thus all others work, too. adjustment screws. 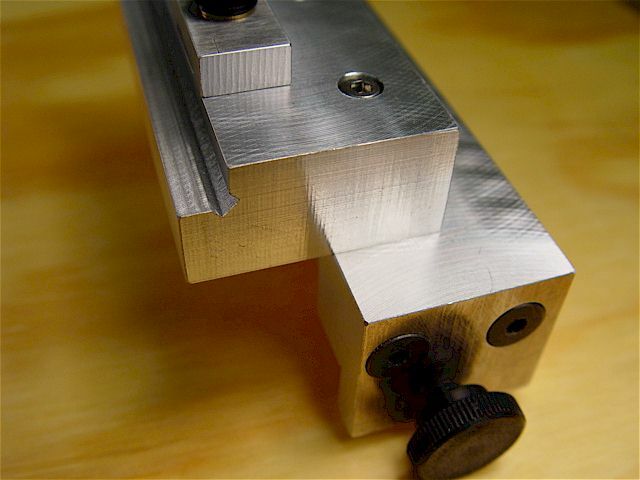 The cross slide's top edges are heavily chamfered so no relief cuts were needed. 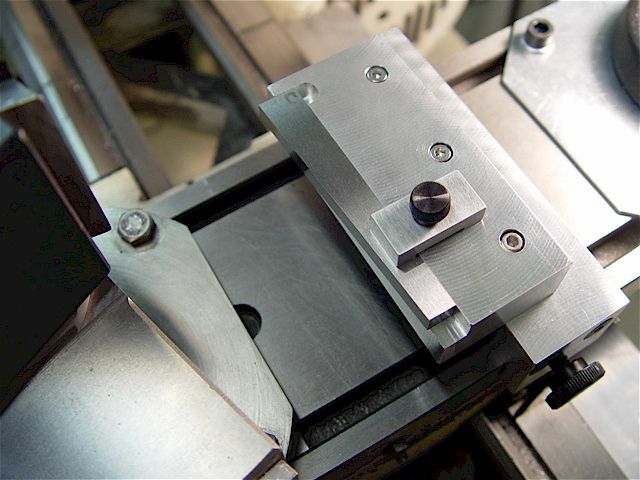 Detail of the 1/4" thick toe clamp. 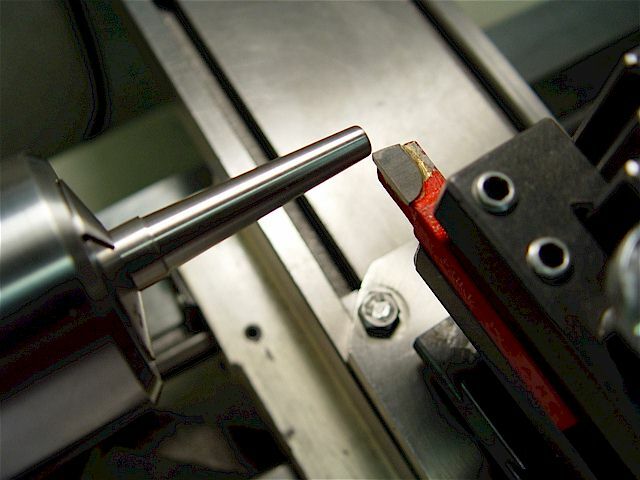 The thumb screw is a plastic cap pressed onto a 6-32 cap-head bolt. A brass washer is under the clamp knob. 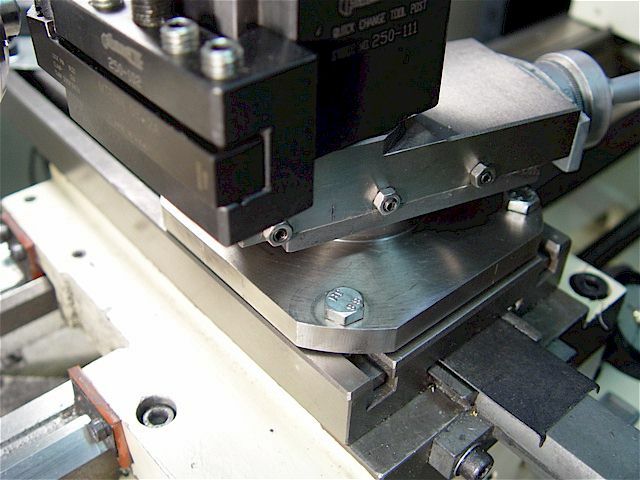 The clamping area is exactly 1/4" deep, same as all of the plates. 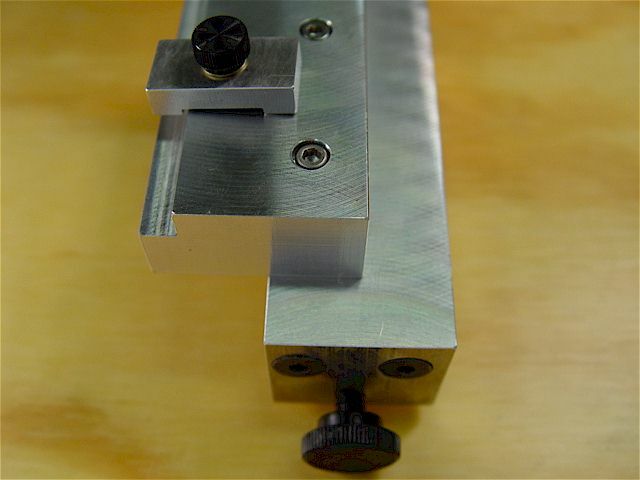 A 1/4-20 set screw clamps the base to the cross-slide table. 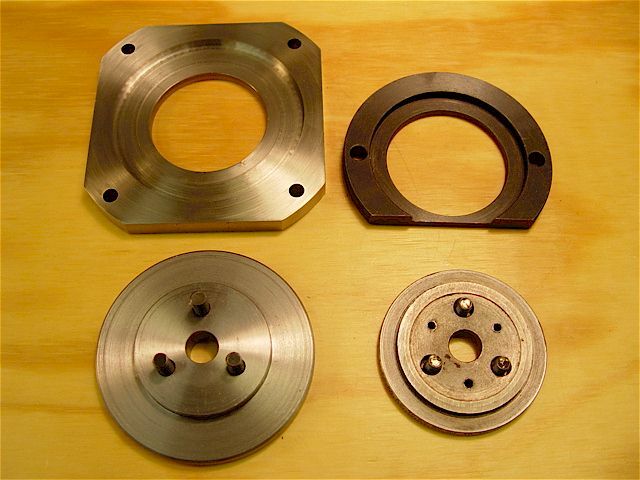 The end plates were bolted on using 10-32 flat-head screws & then the surfaces were fly cut. Note how the square plate corner fits into the relieved corner. 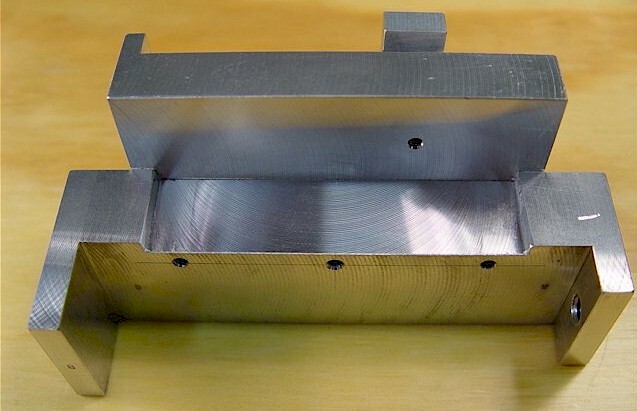 A 3 deg angle setup plate placed into the jig bracket. then locked down. 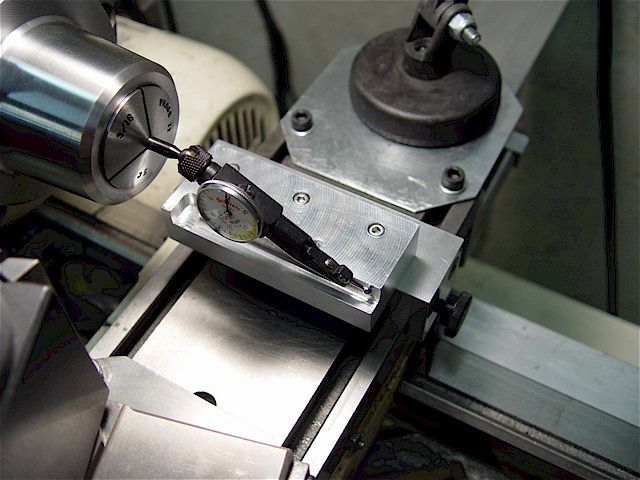 The toe clamp clears the (rotating) tool post. 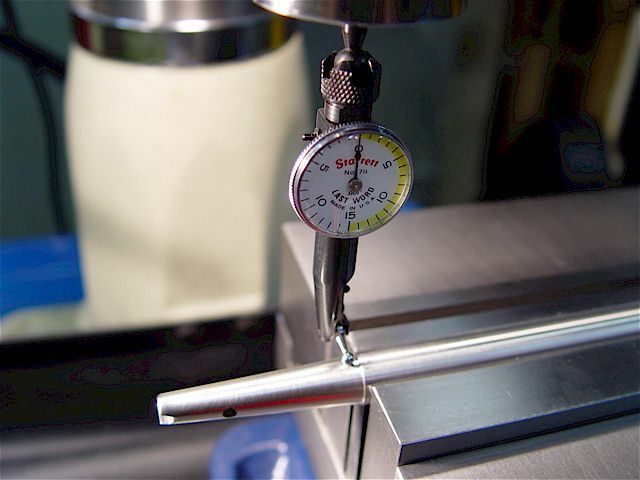 The compound was set at 3 deg to make a 6 deg included angle taper cut on a 1/2" steel rod. 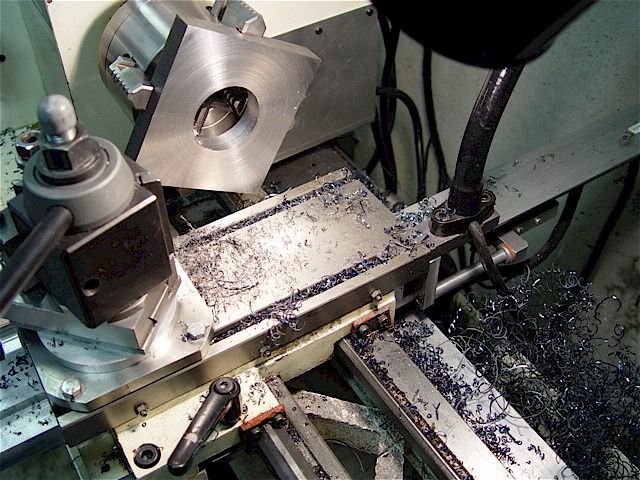 each alternately applied at right angles to effectively remove any machining marks. CAUTION: DO NOT TURN THE MILL ON. 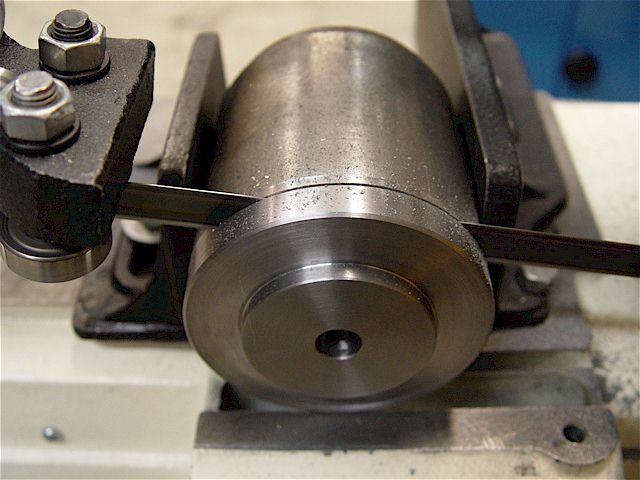 is mounted in the mill quill using a 3/16" R-8 collet. The quill was moved down so the indicator touched the part. 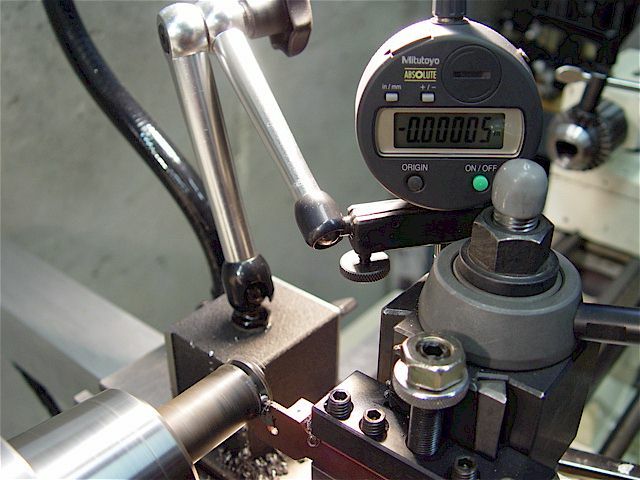 lowered until the dial indicator zeroed & the DRO's Z-axis value (0.0790") was noted. 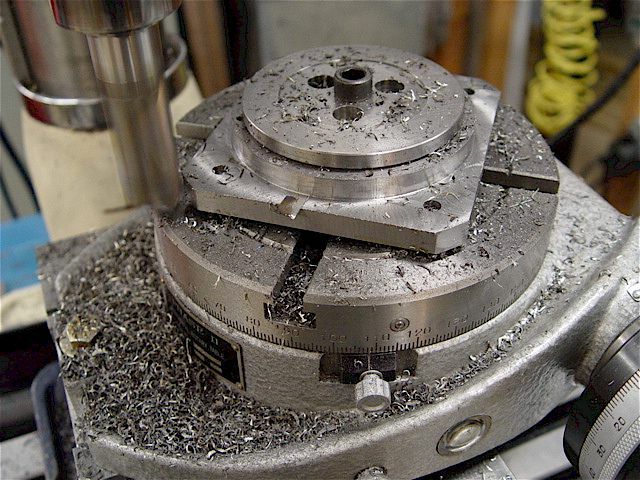 plate is +/-10' & the effects of the other tolerances (parallels, vise, mill alignment, part shank), too. This calculation is analogous to that for sine bars. Note the calculator must be set to degrees. are on the front side for this cut. The angle plate bottom edge must clear the gib adjustment screw nuts, too. 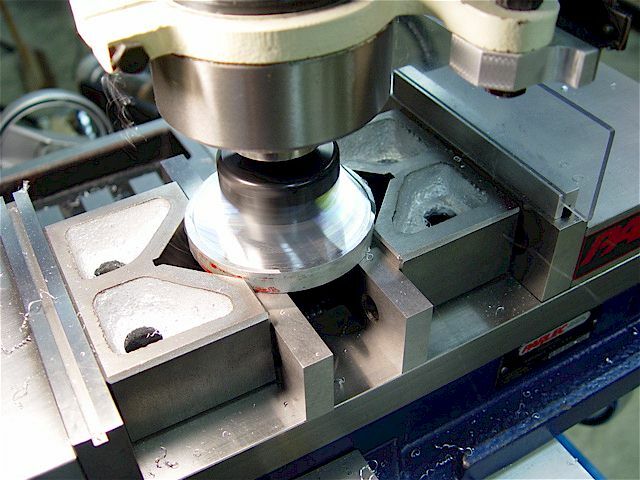 The corner has since been relieved to assure that the angle plate seats completely against the vertical edge. The photos below archives earlier bracket designs & modifications. 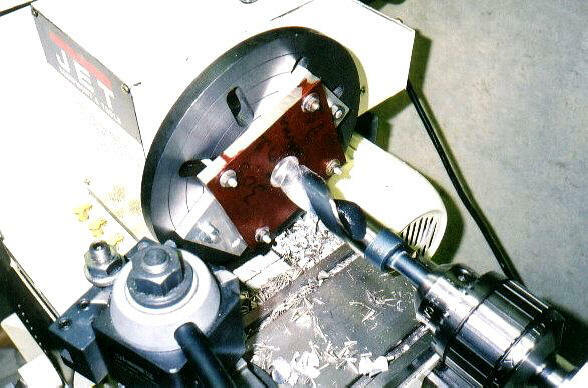 Early website scanned photos showing the plate's center being drilled. 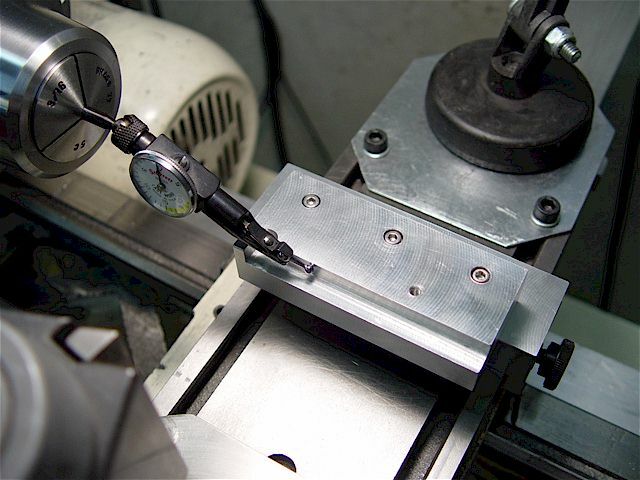 Initial 1" drilled hole. 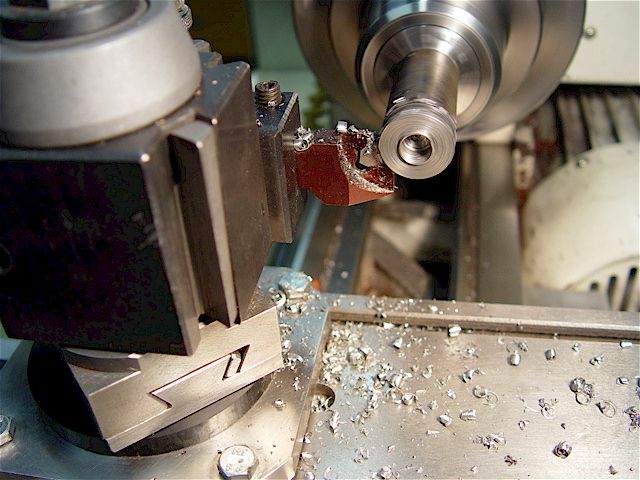 accurately faced using carbide tool bit. 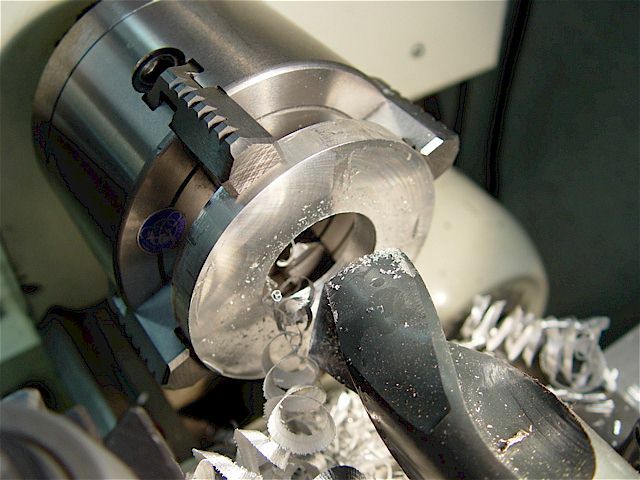 Drill out a large hole, 1" in this example. Lock the carriage when facing. pre-drilled center the piece before tightening the bolts. 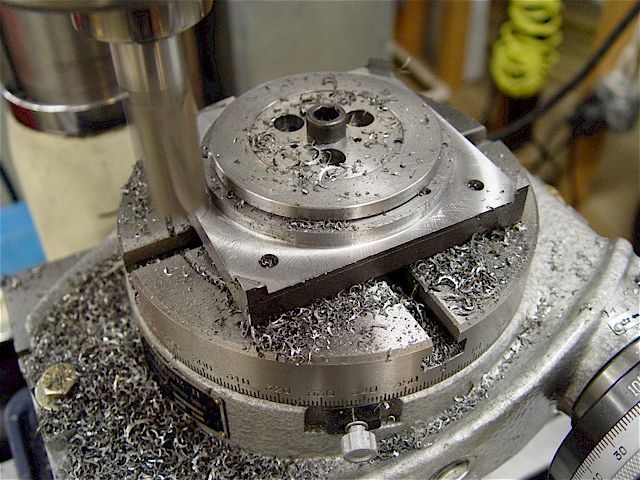 Also made a bracket using a 6-inch, 4-jaw chuck. 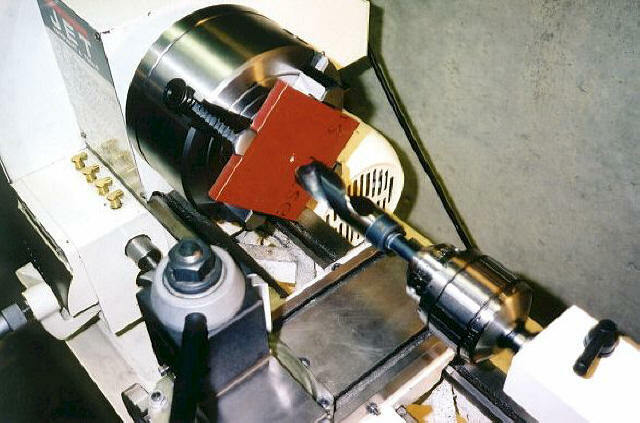 A boring operation shown using a right-hand 1/4" carbide tool bit. protractor corner fits well. 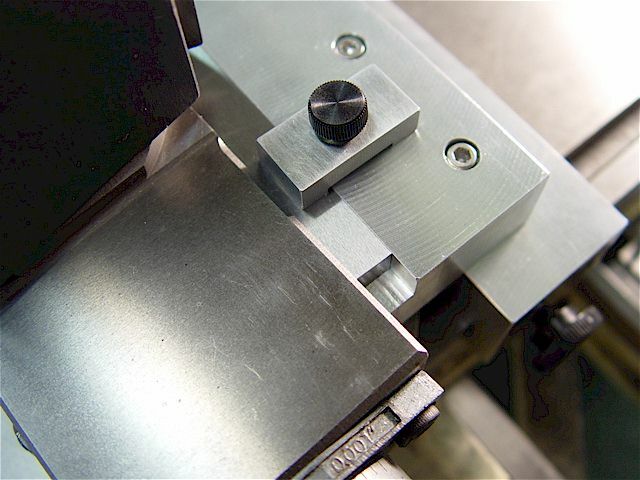 The corners are rounded to allow the compound clearance when pivoting. The protractor is too inaccurate to use so I chose to not expose it & thereby not weaken the plate. 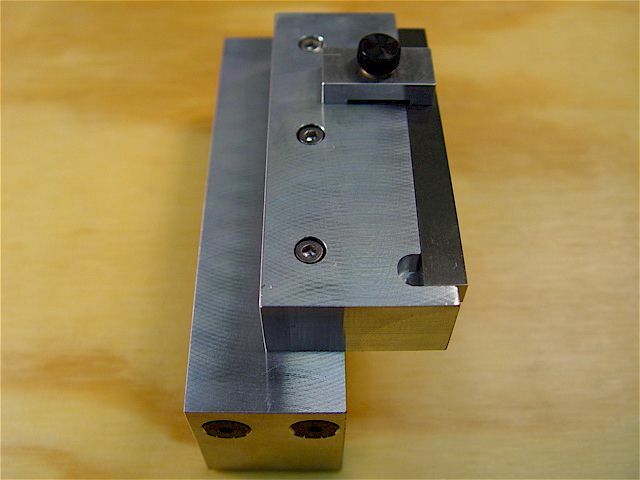 I use a compound angle-plate jig, instead. 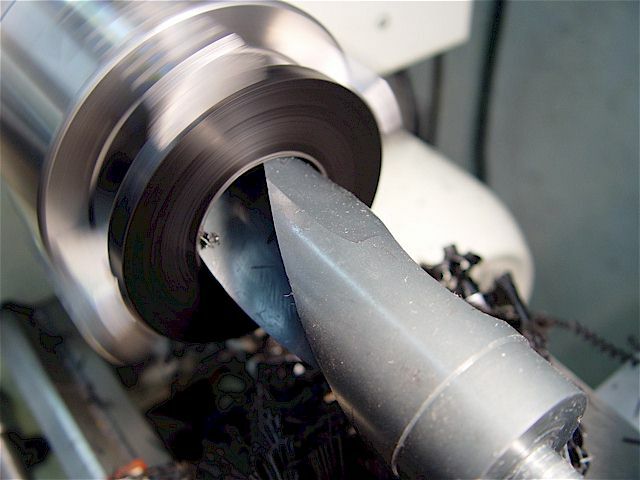 recess using a 5/16" carbide end mill. 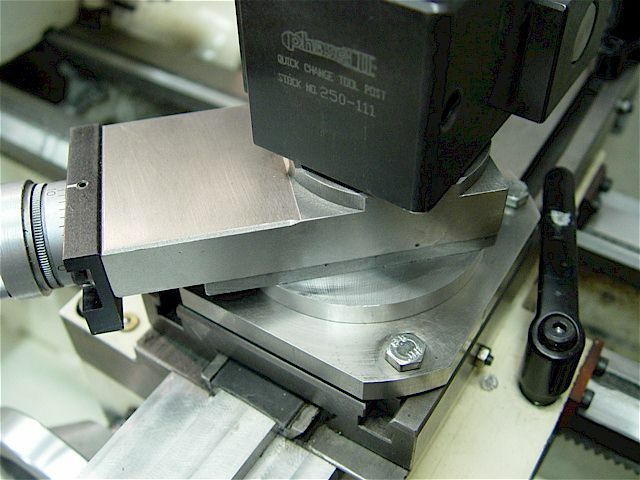 I have since eliminated the bolts recess cuts in an updated plate. 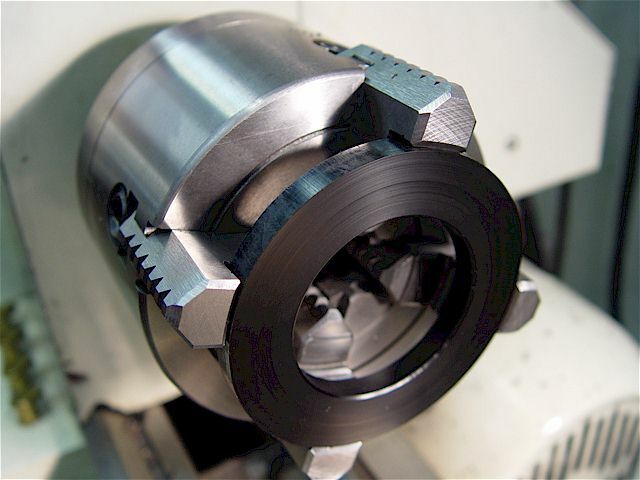 6-in, 4-jaw chuck holding a plate to make a thicker bracket. Compound bracket bolted into place using M6-1, 10mm length, SS hex bolts to keep all the wrenches metric. 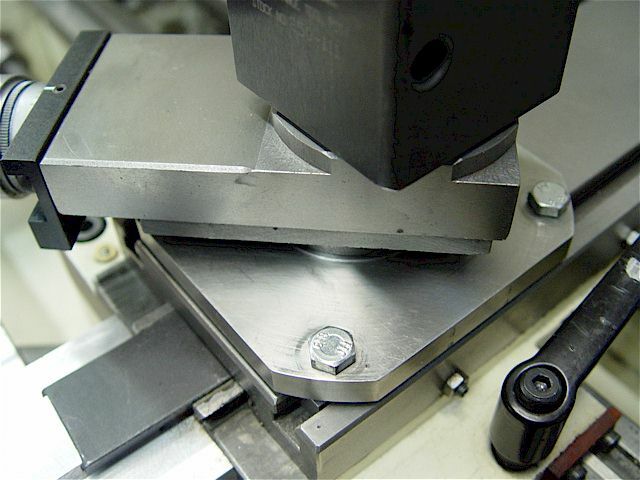 The mounting bolts screw into long, steel nuts that are about 0.2" x 0.4" x 1". pivoting compound for such operations as threading, chamfering & short tapers. Have now increased the size of the compound pivoting mechanism of several dimensions by about 50%. 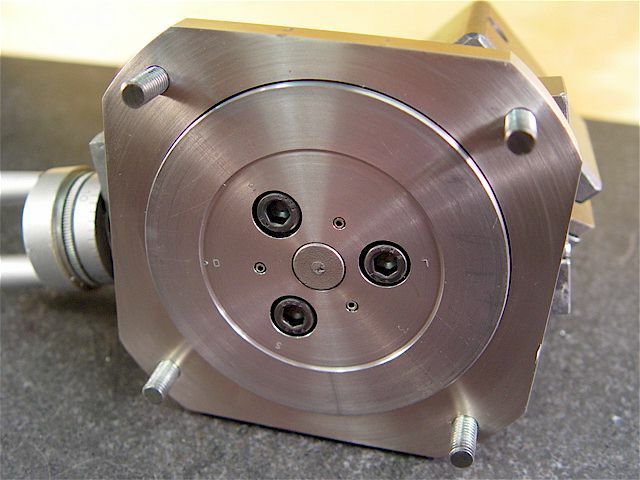 Larger bearing surfaces, less flexing & the incorporation of full-sized, M6-1 cap-head screws. counter-bore. As was the original, three roll pins have been added. 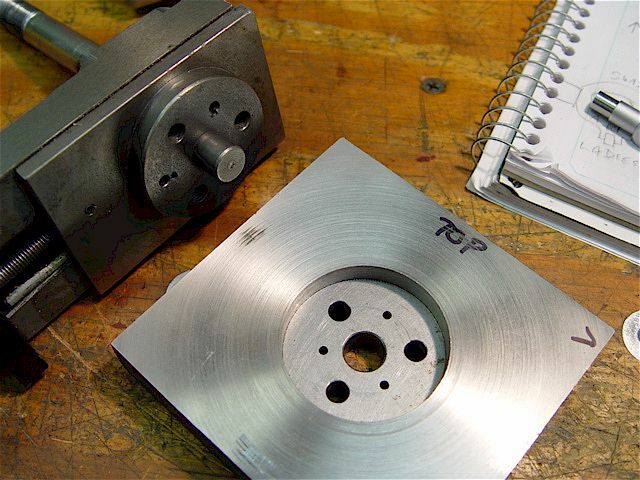 OEM is shown on the right. The plate flexes much less now that the pivoting foot is so much larger. 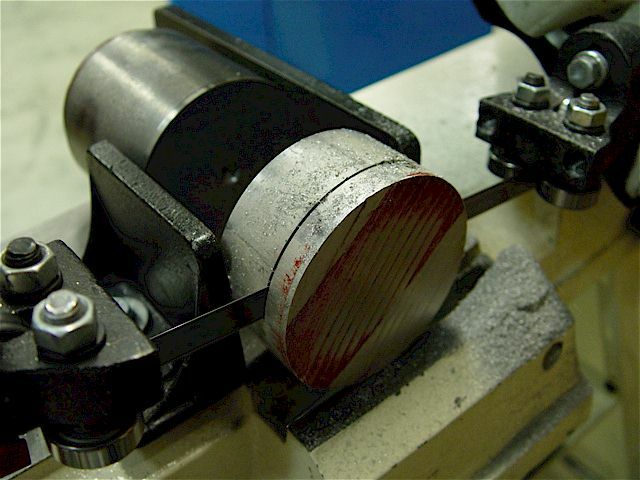 Decided to add a Delrin collar in-between the base of the compound & the bracket for a test evaluation. 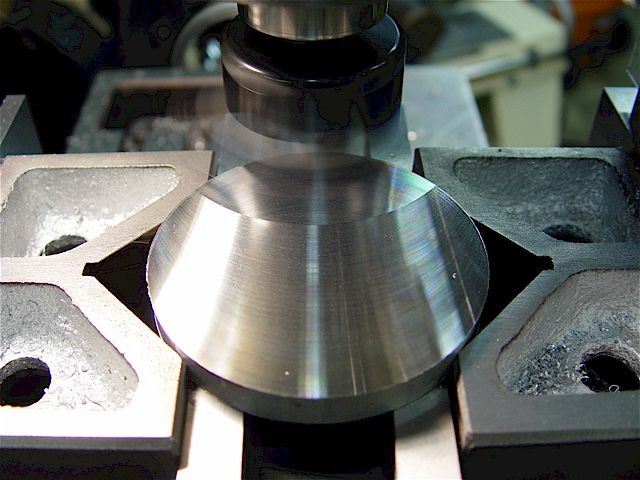 Delrin is very slippery & it was used to allow easier compound rotation. 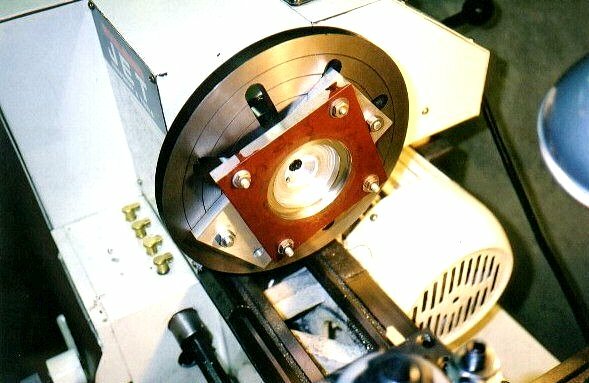 The disk, already 3.1" in diameter, was centered in the 4-jaw chuck & then cut down to 0.305" thick. Drilled out a 1.5" hole before boring to design size. Bored open to 1.9" ID. Chamfered the inner edges with a razorblade while turning slowly. 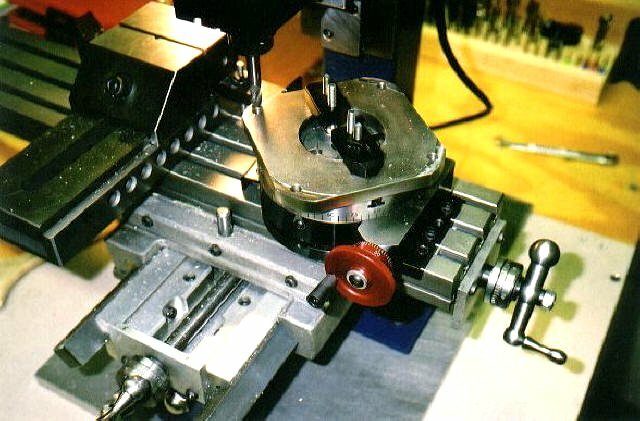 The close fitting collar is shown installed in-between the parts. A tight setup with increased rigidity. 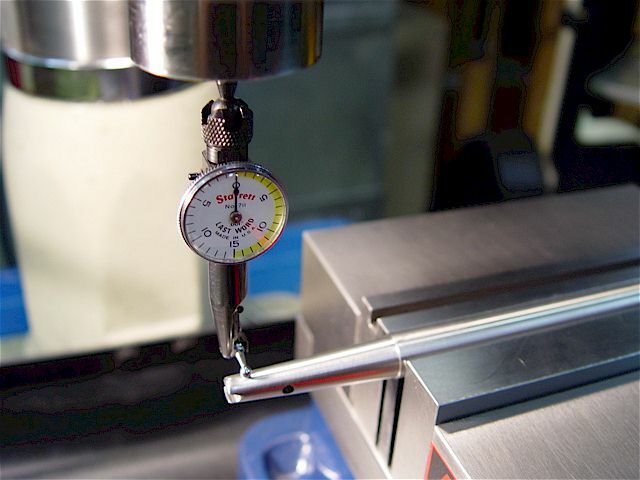 Shown parting at the lowest spindle speed (146 RPM) a 1" soft steel rod using a carbide insert tool bit. Always lockdown the carriage when performing a cutoff operation. The prototype collar worked so well I decided to make an aluminum piece. Increased the OD to 3.2". 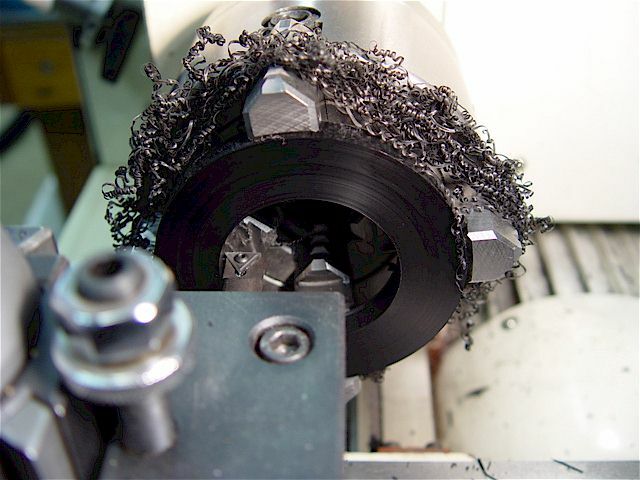 Fly cutting the cylinder on the mill. 1.5" drill bit quickly removed a lot of material prior to boring. Bored a 2.1" ID hole. 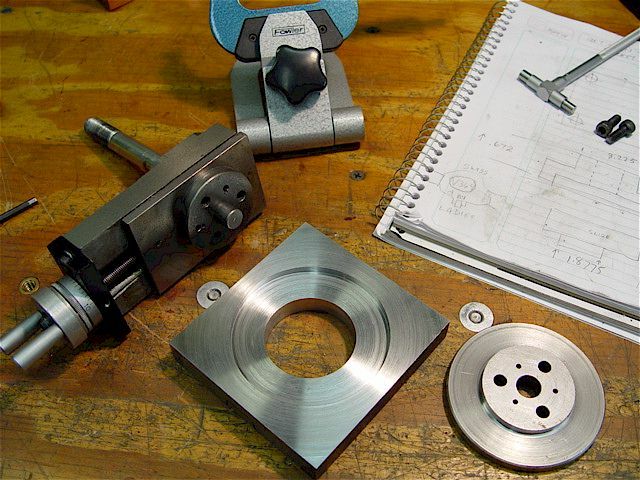 four bottom edges & corners of the compound base to assure smooth rotation when unclamped. 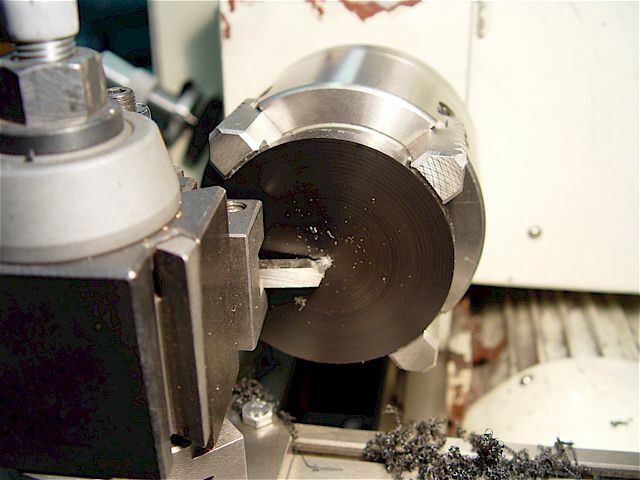 An added benefit is that the collar effectively keeps all of the swarf out of the pivoting mechanism. 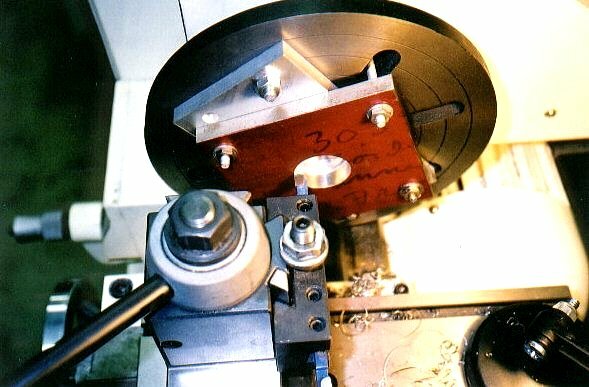 I then added six, 4-40 screws (every 60 deg) to securely fasten the top spacer ring to the base plate.